The attorney general responded after Trump attacked him by saying, "I put in an attorney general that never took control of the Justice Department." Attorney General Sessions fired back at President Donald Trump on Thursday after the commander in chief said his top law enforcement official "never took control" of the Justice Department. In an unusual statement, Sessions said, “I took control of the Department of Justice the day I was sworn in, which is why we have had unprecedented success at effectuating the President’s agenda." "While I am Attorney General, the actions of the Department of Justice will not be improperly influenced by political considerations," Sessions added. "I demand the highest standards, and where they are not met, I take action." The formal response marked a rare instance of pushback from Sessions, who despite facing repeated and harsh criticism from Trump — as well as calls from him to end special counsel Robert Mueller's Russia investigation — has largely refrained from replying. 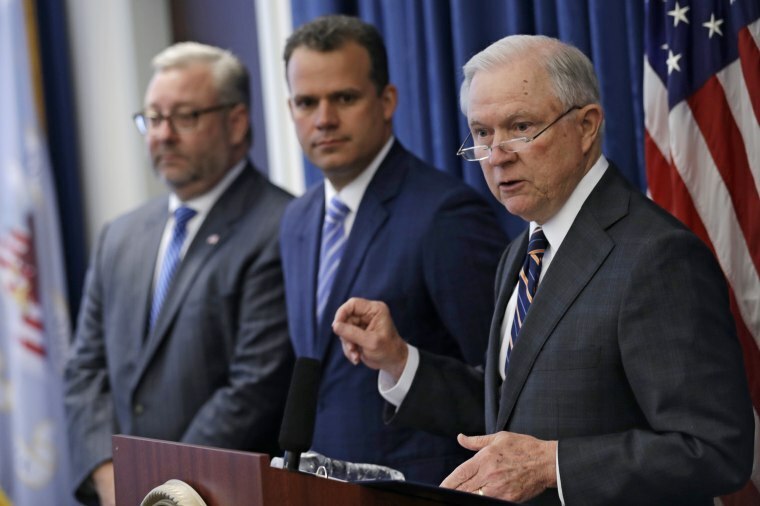 Sessions, who was the first U.S. senator to endorse Trump during the 2016 race, provoked his boss's ire when he announced last year that he would recuse himself from any federal probe into Russian election meddling. In his latest attack on Sessions, Trump slammed his attorney general for the decision, saying he didn't take control of the Justice Department. "I put in an attorney general that never took control of the Justice Department, Jeff Sessions," Trump told "Fox and Friends" in a taped interview that aired Thursday. "It's an incredible thing." Trump told "Fox and Friends" that "Sessions shouldn't have recused himself” or at least, "should have told me." "He took the job and then he said, 'I'm going to recuse myself,'" the president said. "I said, 'What kind of man is this?' And by the way, he was on the campaign. The only reason I gave him the job, I felt loyalty. He was an original supporter." But when asked whether he would fire Sessions or Deputy Attorney General Rod Rosenstein, who, because of Sessions' recusal has authority over the Mueller probe, Trump said he wants "to stay uninvolved." Trump has criticized Sessions several times since the attorney general announced his recusal in March 2017. In May 2017, Trump fired FBI Director James Comey, which ultimately led Rosenstein to appoint Mueller as special counsel. Earlier this month, Trump called on Sessions to end the Mueller probe, and in July, he ripped him as "very weak." In June, he directly criticized Sessions in a tweet for removing himself from overseeing Mueller, saying if he had known the attorney general would do that, he would have appointed someone else to that position instead. The mounting criticism has led many, even top Republicans, to speculate about Sessions' fate. On Thursday, Sen. Lindsey Graham, R-S.C., suggested to Bloomberg News that Trump could fire his attorney general, but not until after the November midterm elections. Later, Sen. Ben Sasse, R-Neb., in a speech on the Senate floor, said it would be a "very, very, very bad idea to fire" Sessions "because he's not executing his job as a political hack" and that he felt the attorney general was "doing his job honorably." Sasse added that he found it "difficult to envision any circumstance" under which he'd vote to confirm a successor to Sessions if Sessions were fired for political reasons. Mueller's wide-ranging investigation has so far secured guilty pleas, including from Trump’s former national security adviser, and the indictments of at least 32 people and three Russian firms. The confluence of bad news has prompted chatter that Democrats might try to impeach Trump if they take the House in the November midterms. But in his Fox interview Thursday, Trump said that if he were to be impeached, "everybody would be very poor." "I don't know how you can impeach somebody who's done a great job," Trump said, adding that if he were to be removed from office, the "market would crash." "Everybody would be very poor," he said.